If you are not a regular beach-walker and seashell collector, it may seem that the good seashells (usually we think they will be big too) will be easy to find. If only you find them first. But heading to the right beach, at the right time, is not all it takes to find unique and wonderful shells. Often a closer look at the sand beneath your feet will give up surprises. In my photo below, it seems as if there are few shells here to find. But that is not true. All the seashells in my photo (next one down) were collected in one day here. But I had to look closely, and I picked up a lot of stuff I didn’t want, in order to find them. I also walked back and forth along the breakers more than once. As I walked the beach at Ponce Inlet yesterday afternoon, I didn’t see many people looking down at the sand. Most people were hanging out in chairs, or walking and talking, or in the water fishing. It occured to me that searching for unique shells takes some intense looking. I had to closely scan the sand around me in order to collect some unique, smaller keepers. It made me wonder if anyone ever looks closely at the shells beneath their feet. I know they would scramble to pick up a whole starfish or sand dollar, but I doubt many people give much thought to other inconspicuous shells, or the creatures who made them. The beach was full of shells, with more being exposed as the tide went out quickly. 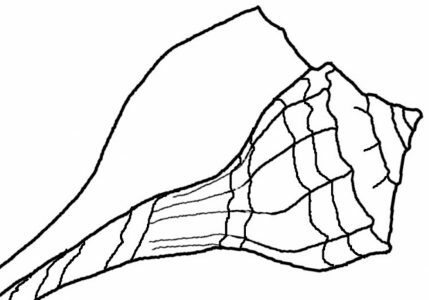 Most were the commonly found arks and other types of clams. They are thick bivalves, which make them easy to find in one piece. Don’t get me wrong, they are nice looking, but can be found all over this area. I was looking for something that would be relatively rare to add to my collection. My sons and I spent nearly three hours on the beach, fishing and beachcombing (they fished), and today my back aches from the constant bending and standing. Who knew that shell collecting could be a workout? I found many beautiful shells, and a few I have not collected before. Unfortunately the surf is rough and finding whole shells here is difficult. So I collected some pieces of shells, and bits of sand dollars, knowing that I may never find a perfect specimen. A few of the shells I found were easy to see, just beneath the waves, or stuck in the soft sand. The big, white Angelwings immediately attracted my attention, and although pieces were missing along the tops, I took them home. I also brought home three Channeled Duckclams, which I see a lot, but are always broken. Usually I only find bits and pieces not worth collecting. Yesterday I did take the big broken ones. Their shells are thin, like the Angelwings, so finding a perfect shell is tough. Other shells that were fairly easy to find were the black ones. Black stands out against the beach sand, and against the others. Happily, most of the black shells I went for ended up being Jingle Shells! One black shell was a piece of what looks like a whelk of some kind, but I loved finding all those jingle shells. But some of the most awesome shells I came across were very small and could only be found by looking closely at the sand. They blended in with all those arks, but every now and then something different would catch my eye. It helps to know a little about seashells. They are not all the same, although at first glance they may seem to be. Jingle shells with clams, dosinia, and piece of a spiral shell. I was able to add two Dosinia shells to my bag (lower left in photo above). I love the feel of their smooth flat surface. And I rarely see them. A little gray sharks eye was sitting on the sand, and although it was broken, I collected it. I’ve found big beautiful sharks eye shells while out boating but they are always inhabited by hermit crabs. Other unique (to me) shells were the Stout tagelus, slipper shells, cross-barred venus, a black scallop, and two lettered olives (one alive, which I left in the sand). And I found some things that have baffled me. I’m still researching photos in my seashell book, Florida’s Living Beaches, to discover what they are. As I write about each of the shells I found, I will link back to this page so you can click to see the photos of the shells.